dirt track (90%), asphalt (10%). 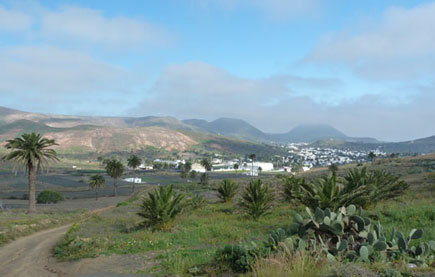 Our day begins at the charming village of Haría located at the One Thousand Palm Tree Valley. Haría is surronded by lush green fields and colorful meadows and the whitewashed houses and shady palms line its narrow streets. 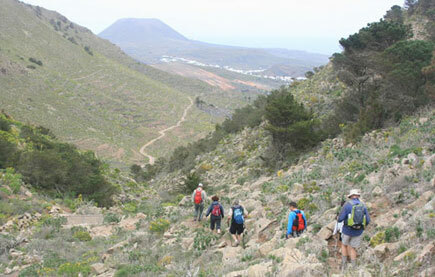 We walk all the way up to the highest point of Lanzarote along the lenght of the “Camino Real”, a former path used by the people of the valley to communicate with the neighboring villages. 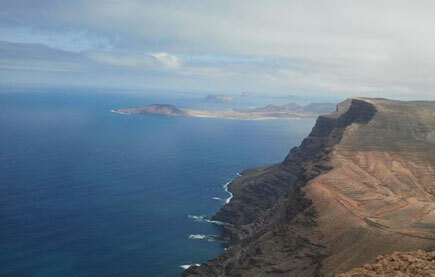 Once we reach this point the views of the central plain of Lanzarote and the cliffs are stunning. Our journey continues towards the former capital: Villa de Teguise, one of the oldest european settlements of the Canary Islands. Walking through the cobbled streets and old whitewashed houses take us back to the Landlord times when the island was attacked by pirates and slave hunters. 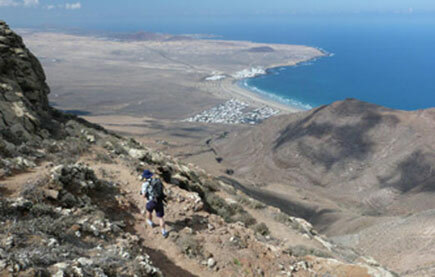 Due to the favorable weather conditions in this part of the island concentrates most of the endemic plants of Lanzarote such the verode (Aeonium lancerottense), tojia (Asteriscus intermedius) or the viborina de Lanzarote (Echium lancerottense) amongst others. We might also have the opportunity to see some birds that nest in this area such the Anthus berthelotti (Berthelot´s Pipit), Lanius meridionalis (Southern Grey Shrike), Trumpeter finch (Bucanetes githagineus), Falco eleonorae (Eleonora´s Falcon) or the Egyptian Vulture ( Neophron percnopterus).